THE PICKIEST EATER IN THE WORLD: CRASHING THE STOCK MARKET CAFE! Just before the Christmas break began, my lunch buddies, (My giant) Joel and the lovely Donna couldn't figure out what to do for lunch (Which is becoming more and more of a problem these days). Since the Christmas season was looming upon us, the last days at the office were a little bit slower than the usual, so everyone in general was feeling lax. Joel asked if we wanted to go out for lunch for a change. The last time we went out, we ended up in Ma Maison, which wasn't so bad, but a member of the Bistro Group of Restaurants, the group that slighted me a couple of years ago. To us, "going crazy" for lunch means driving off for a quick lunch at the nearby Greenbelt. This time, however, Greenbelt wasn't going to cut it for us anymore. Joel suggested we head off to Bonifacio High Street foar a change. 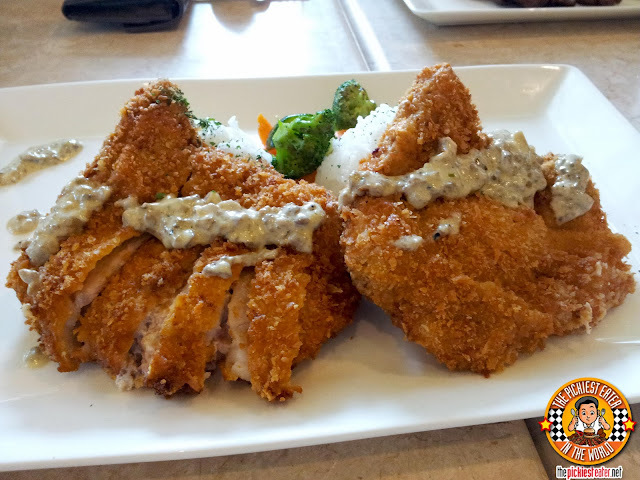 After strolling a little around High Street we realized that the restaurant choices around that area isn't something you can't find around Makati Business District. Fridays, Brother's Burgers, Italianni's.. 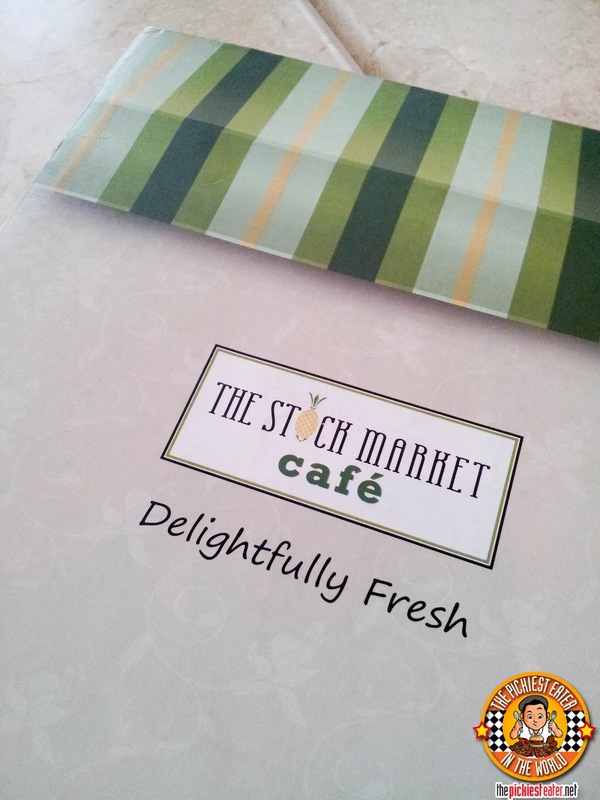 There was one restaurant that I knew was there that I hadn't tried yet.. Stock Market Cafe. We checked out the menu and decided on there.. Not knowing I was about to be in for a big surprise. Joel had been here a year or so ago, and remembered enjoying it. But Joel being Joel, he has no recollection what it was he ate there, apart from the huge crepe for dessert. With it's white interiors and huge picture windows, I found the place to have a relaxing atmosphere. We ordered our food, and we were minding our own business when the waitress walked up to us and asked if we would like to avail of their discount card for the group of restaurants their under. I felt a little pinch in my gut and asked, "What's the name of our group?". She replied with a smile, "The Bistro Group, Sir". I buried my face into my hands and shook my head. Once again, I unknowingly walked into the lair of my nemesis, The Bistro Group. Yes, the same owners as Flapjacks, Krazy Garlik, Pig Out and the most recent, Ma Maison. The same people that didn't give me my card after I purchased it from them. I explained to the waitress my gripe with The Bistro Group, but she assured me that If I purchased the card today, I would leave with the card TODAY as well. In the end, I stuck by my principles and decided not to sign up for them once again.. Not until I get an explanation of what happened to the first card I purchased from them. 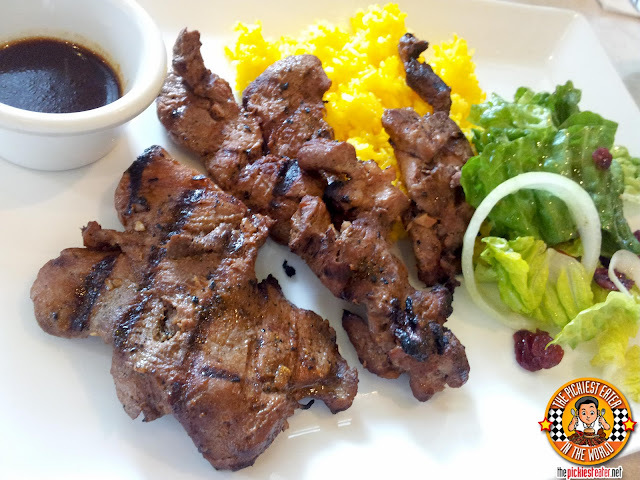 Joel ordered the Pork Tenderloin Madness (P475). By nature, I tend to stay away from tenderloin cuts because of its lack of fat, which was the case with this dish. Though the pork actually did have a nice charred flavor to it, and the Barbeque sauce it came with was very tasty, but as meat does when there's too little fat in it, it came off to me as a little dry. Joel was pleased when he saw in the menu that it came with a side salad, which turned out to be just a couple of leaves of lettuce, a couple of onions and some stuff that looked like dried cranberries. 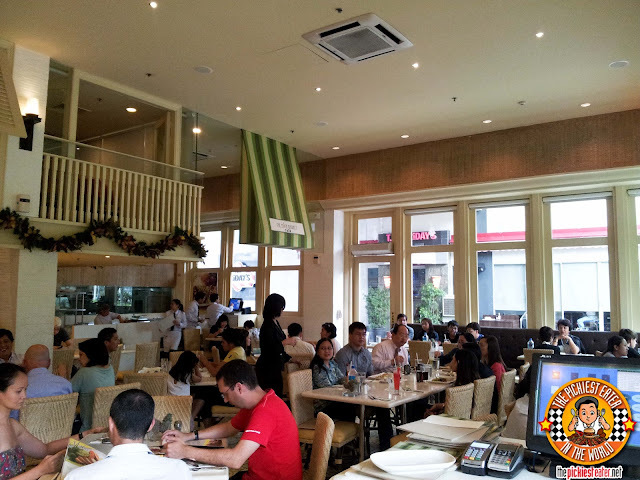 I was contemplating between getting the Porky Chops (P595) or the country style spareribs. Since the Porky Chops had Canadian Bacon in it, that eventually won out. I was pleasantly surprised with the size of the dish. But taking the price into account, then I guess I DESERVED two Pork Chops instead of one. This is actually good for two people (Or in my case, one RichieZ). 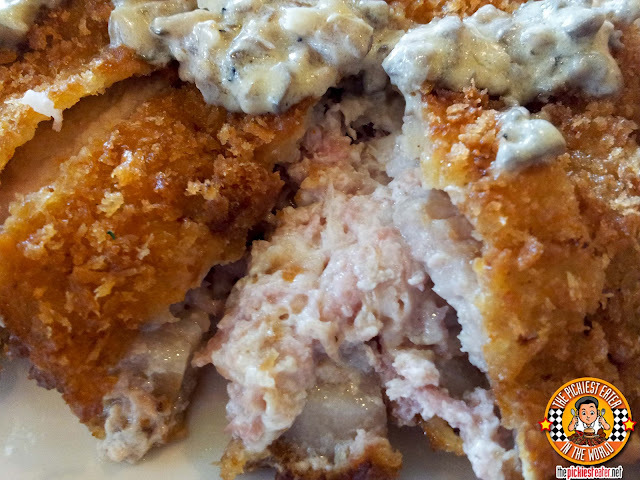 The chops were fried into a gorgeous golden brown, and it was topped with a rich mushroom ragout, which I felt the porkchop could have used a little bit more of. 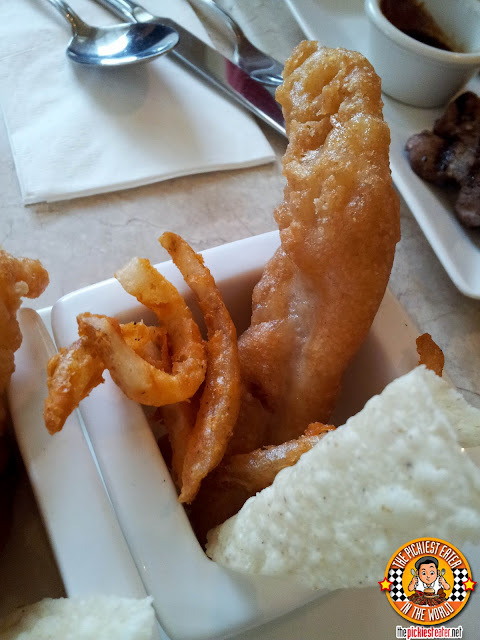 Donna ordered the Southwest Fish and Chips (P395), which had a rather unique presentation. 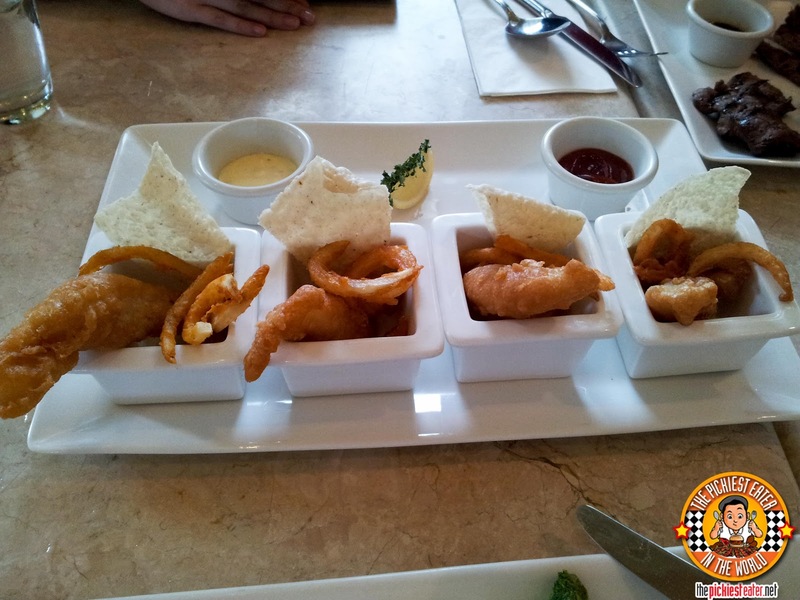 Four large pieces of fish were placed in four separate bowls and filled with french fries and White Corn Nacho chips, then placed neatly on a huge platter alongside two different types of dips. I'm assuming the light "pepperiness" of the bread coating is what made this "Southwestern", but regardless of the name, it was quite delicious. The beautifully crunchy golden exterior gave way to a spotless piece of white fish. The fries tasted similar to Mcdonald's twister fries, and the corn chips also had a nice salty flavor. The fish went well with the garlic dip (I think it was aioli). Perhaps the only comment I had was, considering the price, I think they could have come up with a more creative second dip aside from "Ketchup". A Honey Mustard, maybe? Or a Southwestern BBQ sauce? But apart from that, one of the better Fish and Chips I've ever tasted. Even before ordering a single entree, Joel declared he would be ordering the La Sorbonne for dessert. The La Sorbonne (P275) is a huge battleship of a crepe, filled with fresh mango, banana and ice cream. 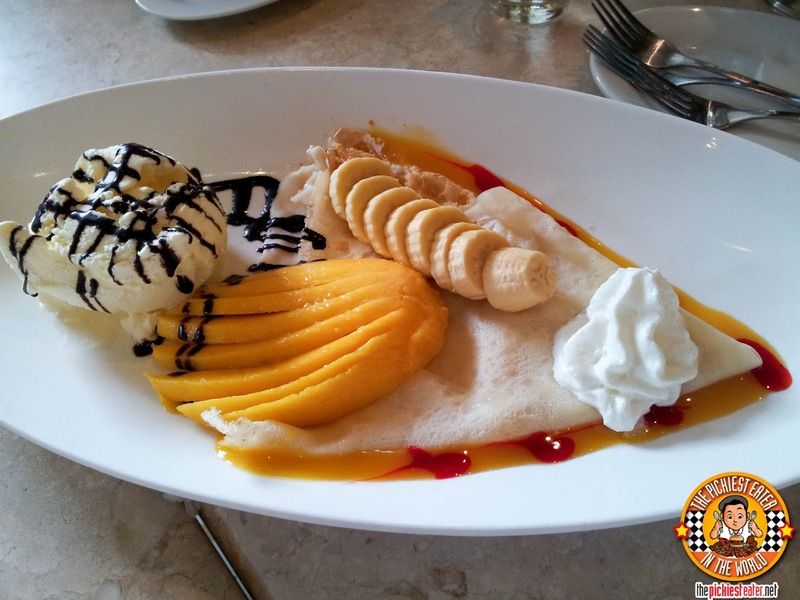 The crepe itself was light and delicate, with a touch of sweet, milky flavor. I prefer my crepes a little bit more done though. Truth be told, I honestly didn't think this was anything special. I could get something better at La Creperie for much cheaper. 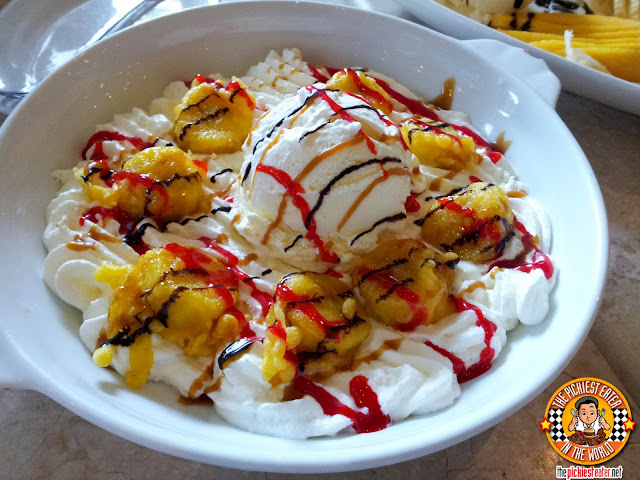 If you're the type of guy like me that would willingly eat whipped cream straight off the spray can, then you'll enjoy the Banana Explosion (P275) . It's basically fried bananas that was coated in a special "butter" (I think they may have meant "batter"), laid out on a bed of whipped cream, drizzled with strawberry and chocolate sauce, with a scoop of ice cream in the center. This had a whole lot of potential to it, but I feel that they needed to make a deep fried bananas crunchier. 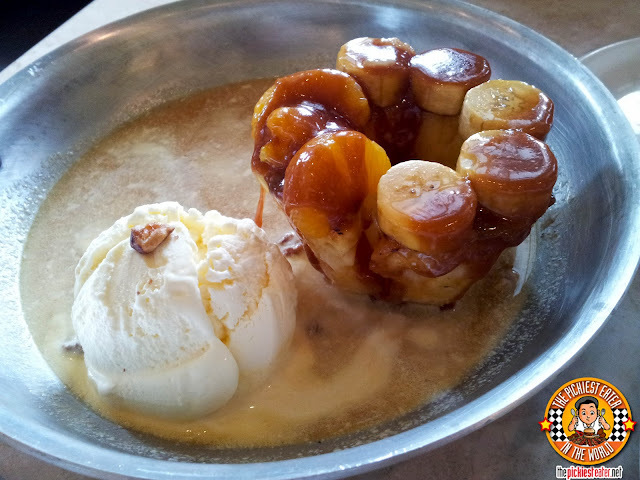 it was a bit underdone, making the interior of the deep fried bananas barely distinguishable from normal bananas. Donna ordered the "Flaming Fruity" (P295), assuming that it was some sort of a Flambe' dish. Despite the fact he brought it out in a frying pan, we were told by the waiter it was not, because it could possibly be dangerous. So since there were no flames here, it was just "fruity" (So why'd they call it that?). I actually didn't like this at all. It was basically just a thick cut of plain pineapple, slices of plain bananas, that were bathed in a caramel that lacked punch flavor-wise, and succeeded in getting in between every single tooth in my mouth and hardening, making it difficult to remove afterwards. 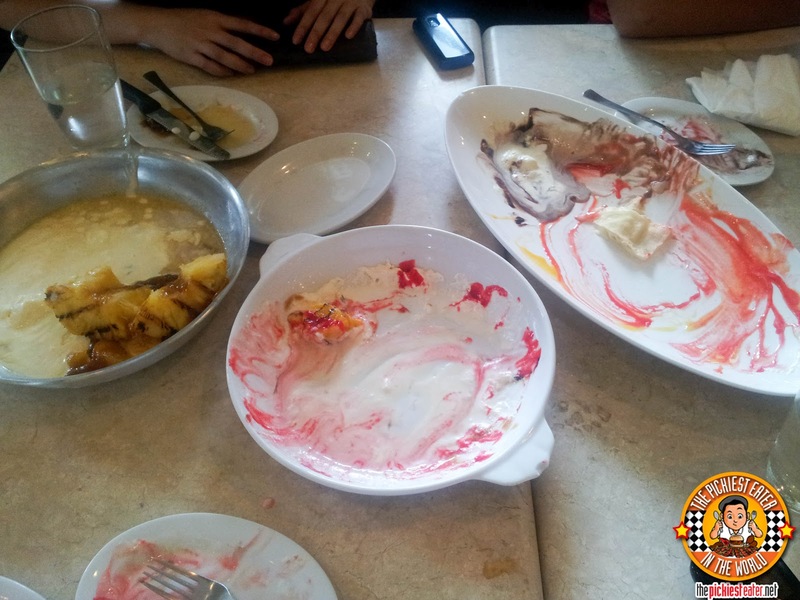 In the end though, our sweet tooth(s) got the better of us, and we worked together to finish our respective desserts (except for Donna, but mainly because the caramel made the dessert virtually impossible to eat without fearing a trip to the dentist). Lunch Buddies, The lovely Donna and my Giant, Joel! I could easily see myself liking a lot of the dishes The Stock Market Cafe has to offer (Like the burgers and ribs), however the price range is a bit too rich for my blood, so I doubt I'd be able to try them all. I would recommend their entrees to a friend, but their desserts? Nah.. I've had much better for far cheaper. Haha.. I think you are an unconscious magnet for the Bistro Group.. :D I'd love to try Stock Market Cafe but prices are quite steep for my budget. Btw, I just noticed.. Donna's orders are very unique in presentation ah. Now those are proper, spot-on pork chops! Everyone else can chow down on tenderloin or some other "healthy" main, but you've sold me as to those pork chops. Bring on the bacon - and then some! Sumi, it's like we're destined to be together or something hehe.. yes the presentations were unique, but the Flaming Fruity was visually pleasing, but to the palate, not so much. 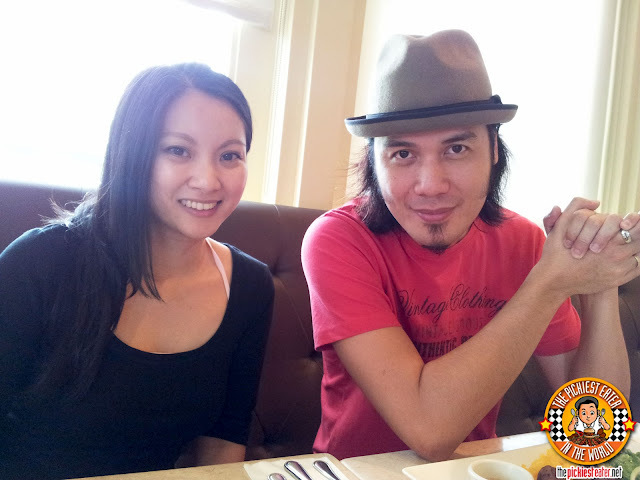 Edelweiza & Midge, I think you and I would get along just fine.. hehe.. hope we all could meet some day! I've been seeing this restaurant in Fort! It's ironic how my work is here in the Fort but I can barely go out. This calls for a resolution! :)) Thanks for sharing this, I'd put this on my list of dining-to-do's. When you do your post, please share it here! Mind if I linked ya? I've been combing through your previous posts and end result: I've got you on my blogroll too! I love the way you write, especially on the parts where you inject humor or sarcasm. And of course let's not forget your wonderful food-scapades :)) Cheers! My mom never believed me when i said all this sarcasm will be put to good use someday! Hit or miss ang bistro group for me. Yet, I'm still interested to try. =D So far haven't tried this and the bulgogi brothers.